Consultant, coach, and speaker Scott Deming knows a lot about purpose. While he had been developing business practices based on purpose for years, his mission was crystallized when his 3-year-old granddaughter was killed by a preventable household accident. After going through the initial phases of grief, Scott was able to start developing a mission to help families prevent these types of accidents: all based on his new-found purpose to save kids’ lives. 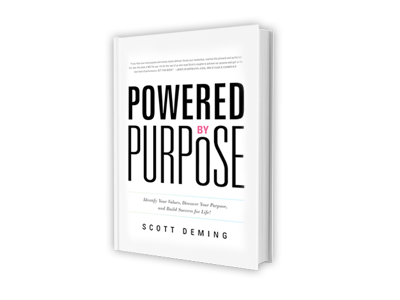 In his book Powered by Purpose, Deming brings in examples from his many years in the advertising business and his more recent experiences as a champion of child safety to tell the story of why every business owner needs a purpose before he or she can truly be successful. His argument is that no business owner can create a lasting, meaningful brand unless he has a clear purpose and can relate that purpose to his employees and make sure they are working toward that purpose every day. The good: If you are a business owner, you’ll find this book really resonates. If you do NOT currently have a solid purpose behind your business, you’ll want to immediately develop one. And if you DO, you’ll be thankful that you do and will likely pick up a number of helpful tips on how to use this purpose to drive your company’s success. Deming succeeds in bringing in numerous examples (both personal and of well-known national brands) that help illuminate his points and hammer his message home. He also does a thorough job of showing how to not only develop a purpose, but also how to make sure it carries through your entire organization. The not-so-good: When I say Deming is thorough, that is not always the best thing in the world. He can be overly thorough to the point of preachiness in some parts of the book, especially in the parts involving his child safety mission. At around 200 pages, I felt that at least ¼ of the book was redundant and that it could have easily been cut and still retained all its value. Is it easy to read? With numerous examples and personal anecdotes, Powered by Purpose is a relatively entertaining read. It doesn’t go incredibly quickly, but you’ll be able to get through a chapter or two in one sitting without nodding off or feeling like your brain is full of too much information. Does it make you think? Absolutely. You’ll be thinking about your business and the mission of what your business entails the entire time you’re reading this book, wondering what your purpose is and how you can make it a stronger part of your organization. Can you easily apply concepts to your own life/business? Yes—if you are an entrepreneur or business owner. I wouldn’t think any non-business owners would pick up this book as it is specifically targeting them, but if a mid-level manager or someone similar tried to read it, it could be a frustrating endeavor (especially if they are working for an owner who does NOT have a clear business purpose). Has it/will it change your life in any way? It will change your business, which in turn could certainly change your life. Deming does a great job of showing how easy even the toughest decisions become when you have a true purpose and live according to that purpose every day. Favorite thought/piece of advice from the book: It’s important not only to define your values, but to also define the SOURCE of your values. When you read the book, you’ll see the difference and why it’s so critical. Powered by Purpose is an educational and impactful read for any business owner, large or small. Though you may be tempted to skip some parts in the last third of the book because you’ll feel like you’ve already gotten message, you should definitely add this to your business library.